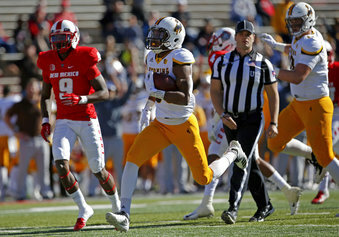 ALBUQUERQUE, N.M. (AP) — Xazavian Valladay and Nico Evans combined for more than 300 yards rushing and three touchdowns for Wyoming as the Cowboys became bowl eligible Saturday with a 31-3 win over New Mexico. The Wyoming (6-6, 4-4 Mountain West) ground game helped overcome a lackluster passing attack as Tyler Vander Waal completed just four passes for 41 yards. But the Lobos (3-9, 1-7) were even worse through the air as Coltin Gerhart and Sheriron Jones combined for three completions and 34 yards. At halftime, New Mexico had 3 yards passing. Wyoming took control of the game from the outset, going 65 yards on the opening possession, with Valladay slicing in from 21 yards out. By halftime, the Cowboys led 14-3 and the game was never seriously in doubt thereafter. New Mexico managed just 83 total yards, while Wyoming had 366 yards on the ground. "To me, this was a beaten-down team, playing a bigger, stronger, more powerful team," Lobos coach Bob Davie said.